The Green Map is a quick and easy resource for discovering Jerusalem's urban cultural, zoological and nature sites. To check out the Green Map, Click here! Want to visit Jerusalem's urban nature sites? Here is a glimpse of the places you'll find on the Green Map! Although the english version of the green map is new to the city of Jerusalem, the green map is an international system that has been around since 1995. To date, there are green maps in 800 cities, towns, and villages residing in 64 different countries. A wide variety of sites are available through the map; everything from a place to recycle, to a bird watching spot, to a bike store. The mission of the green map is to advocate eco- friendly tourism world –wide. Jerusalem is bustling with visitors year round making the green map a perfect way to promote sustainability in the city. The concept of the green map is simple and using the resource is even simpler. Primarily an on-line reference, the basis of the green map system is a set of universally recognized icons; a ladybug symbol represents an insect watching site while an apple signifies a location where you can shop for organic foods. On the website these categories are split into three groups ; nature, sustainable living and culture and society. By clicking on an icon in your chosen category, lists of sites within that category are listed. For example choosing “special garden” in the nature group provides you with a list of gardens and parks in the city. From Here you can click on the specific site you wish to visit to obtain more information including a short description, photos, an address and a map view of the location. The ease in which one can roam the site to find a variety of green locations is remarkable. Beyond the more casual “browsing” mode on the website there are also complex search features that can help you narrow your focus. You can search by category, group or neighborhood to find a green map destination. The neighborhood search is especially useful; allowing you to fit a “green visit” into your day by finding what is in your vicinity. Free search is also enabled on the website. You could search “gazelle” to find a list of locations with gazelles or search for a specific site to find more information. 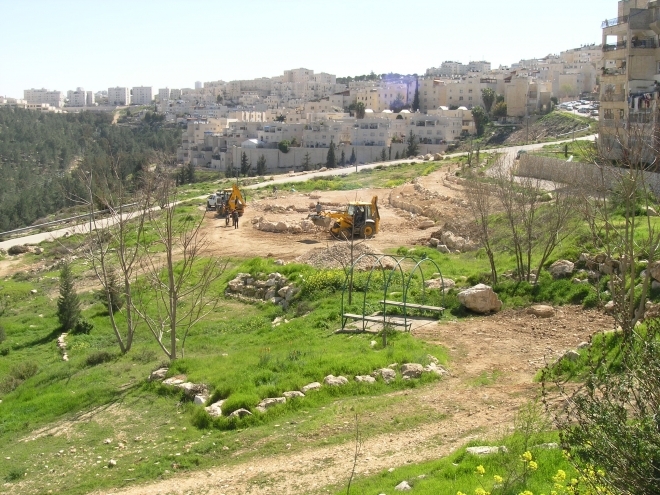 Jerusalem’s green map team has worked with the city to broaden its audience to all residents and tourists. Coordinating with the municipality, there are now a multitude of green map sites on the city map, including an icon key in the back, allowing those unfamiliar with green map to navigate through the icons . Working with the transportation system department, green map sites are also listed on light rail maps throughout the city. By including the city in the green map initiative, SPNI has been able to reach an outstanding number of people with information. The green map is helping point Jerusalem towards a sustainable future. Residents and tourists alike can discover once unknown urban nature in an effortless way. The variety of sites provided on the map allows users to learn more about the environment, appreciate open spaces in the city, and support sustainable shopping. With the spread of the green map and the information it contains, tourism in the city and the perspective of Jerusalem’s residents will be transformed.